Click the link below to register and fill out one form for each person attending. You will be sent an invoice through Paypal to pay for your registration. Your invoice will also include a link to reserve a room at the hotel. Please do not call the hotel to make reservations. Once you register for the event we will send you a link with the group code which will enable you to reserve a room. We ask that you do not share this code with other families that have not registered. Each year we have problems regarding some people being registered but unable to get rooms due to others not registered having reserved rooms in our block. The hotel is not opening our room block until Feb 1st. You will not be able to reserve a room until after this date. Our room block will expire May 1st so all rooms must be booked by this date. KP room rates are $189 a night plus tax for a King or two queen beds. Resort fees have been waived. As long as they have availability the rates are honored for 3 nights before KP and 3 nights after. 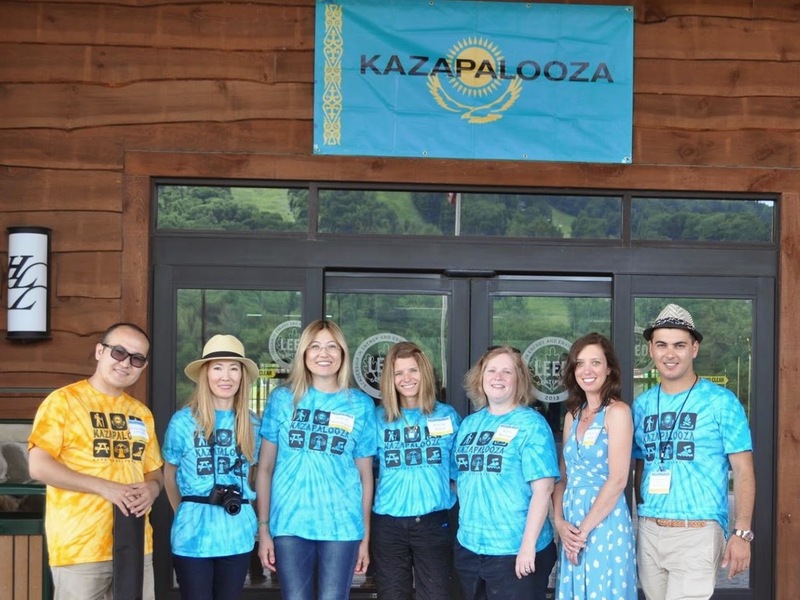 Attending Kazapalooza requires each family to register with our event. 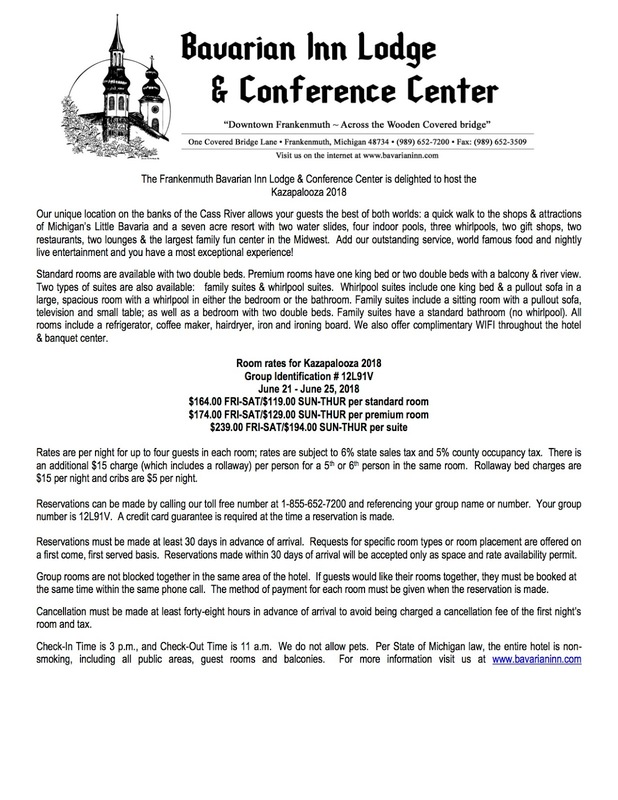 Registration fees are used to pay for event space at the hotel, goody bags, AV for our luncheon, dinner Friday night and lunch Saturday and other essential items to put this event together. Friday afternoon- event check-in to pick up goody bags. You will be able to check in at the Friday night dinner if you are arriving later. Friday night Dinner- usually occurs around 5 or 6pm. We will post more information as we have it. Saturday Luncheon- usually around 11am-2pm. Raffle and slideshow. 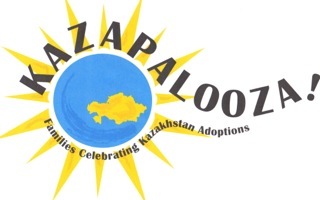 Each year our raffle raises money to a charity working with children in Kazakhstan. This year we are raising funds for Caring Heart, formerly J127 Ranch. You can find more information about them on their website here. We ask interested families to bring a donation for our raffle (this is NOT required). Raffle tickets are $5 each and can be purchased with cash, check or card on Saturday prior to the raffle ending. You must be present to win. If you purchase an optional KP shirt be sure to wear it to this event! Saturday afternoon and evening- free time for our families to meet on their own. Use the dinner and lunchtime to meet new people and make plans. Most of our families spend the day around the pool during this time. It is a great way to meet other Kaz families. Sunday- morning meet and greet to say goodbye. 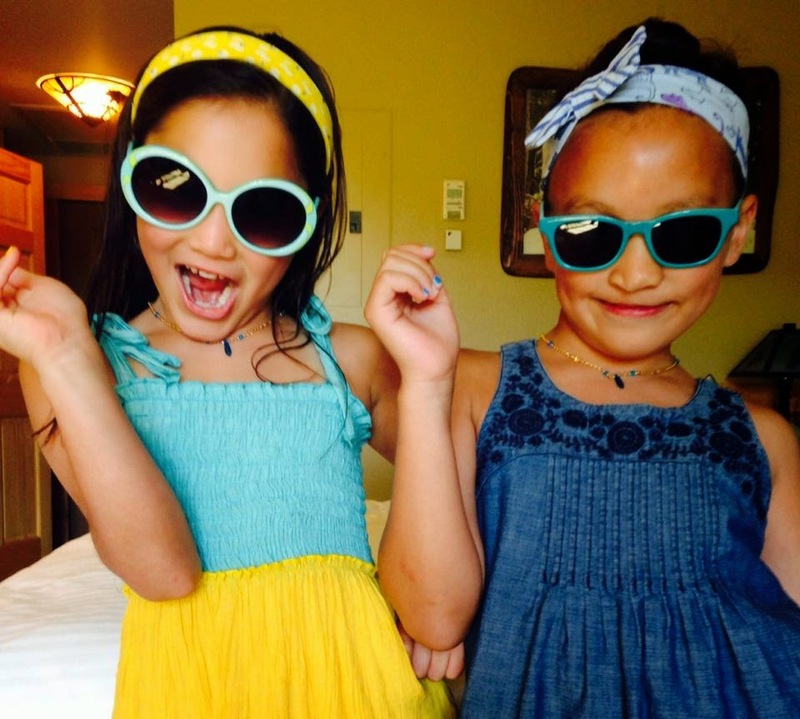 We had a wonderful time in Frankenmuth, Michigan with over 500 Kaz kids and family members! This year our families donated over $28,000 to J127 Ranch/Caring Bridge through the Kid's Marketplace, Heads or Tails, Raffle, and Kid's Talent Show. Thank you all for your generous spirits. Next year we will head to Albuquerque, New Mexico June 28-30th. The registration process will change a bit. You will no longer be able to reserve a room at the hotel until after you have registered with us and paid your invoice. The interest in KP this year has reached beyond anything we could have imagined, much less predicted. In trying to accommodate all who want to attend it has meant that we have had to completely restructure the weekend. With that said, sadly we are still having to keep a waiting list as we have reached almost 600 people and try as we might, there is simply no way for us to accommodate any more. Almost 600 people you say??? If that number frightens you or causes you pause, believe me, it’s having that same effect on us. Below is an outline of the new structure of the event. But please make sure you read all the way to the end! *Both Friday night and Saturday will have two meal times. It’s the only way we can accommodate the amount people in the space available. *Friday Dinner: 5pm and 7pm. Dinner sign up will be at a later date. 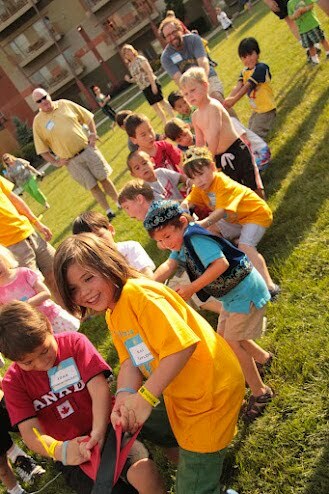 *Friday, Lawn Games 5-8 pm…Come play before or after dinner. *Saturday’s Luncheon 11 and 1. Lunch times will be assigned by regions. *There is simply not enough space for all of us to be in the raffle space at once. Therefore, if your lunch time is 1:00, you will be able to browse the raffle, purchase tickets (we will be encouraging presale of tickets!) and make your selection between 11-1. If your meal time is at 11, your raffle time will be from 1-3. *Important! The actual raffle will start at 4:00. This is the only way we are able to do the raffle with this many people. After the luncheon the room will be rearranged to theater style to accommodate our large group. We will work as diligently as possible to move as quickly as possible through the raffle. We’ve become much more efficient throughout the years. **You MUST be present to win!! *Sunday: Coffee and some kind of breakfast goodie. Time and details still to be determined. *Sunday: Talent Show…details still to be determined. As mentioned this is currently just an overview of the weekend where we stand right now with things. Everything is possible to change if/as needed. Please keep reading!! The following information is important! It has been brought to our attention that there are families who have not been able to register or are simply not going to, but plan to come anyway. We cannot tell you that you are not able to do this, but please let it be understood that you will not be able to participate in the KP events. On the flip side, we have also heard from families that have registered that they may not participate in the planned events because they don’t like the structure and/or there are just too many people. If you know ahead of time you aren’t planning to participate due to the structure or sheer number of people, we ask you to reconsider coming as there are people on our waiting list who would love to come and actively participate. This year is unlike any previous years, so we understand any reservations any of you may have about attending. More than anything we want KP to be a positive experience for your family, so if you believe after reading this that you do not believe this year’s KP is a good fit for your family, we have decided to offer a one-time full refund from (March 14-March 21). All you have to do is contact Gretchen privately and she will issue you a refund. Refunds after this time will not be accepted because once we have our budget in place we depend on it for the event. **Also, if you have registered but have NOT paid, it is also critical that you contact Gretchen as well to cancel. If you don’t tell us, we won’t know to fill your space. I know this is a lot of information, but we wanted each of you to know exactly what KP looks like as of now. We love our families and we do not want to lose any of you! With that said, we know that KP can prove to be overwhelming for children and adults alike, even in smaller years. So please take time to consider the size and structure of this year’s event and decide if you think it will be an overall positive experience for you and your child(ren). If you have any questions please contact any of the planners. Every year as we start to look for venues, we generally have a region in mind. We pick states and then start researching. Over the last 10 years, we have looked at just about every obvious resort out there. We have a long list of criteria. Many places end up on the proverbial cutting room floor but may stay on our maybe someday virtual list. You've heard it said "it takes a village" and in fact, that is true for us. We were in negotiations with several hotels and continuing our search when we received an email from one of our KP families that had visited a place they thought could be a future KP venue. It was in one of our target states and this place had been on our radar but we had yet to have contact with them. So the email prompted us to call and after several calls and emails and a visit by Karen in September, we feel that this venue will be a unique and fun place for KP 2018. Kazapalooza 2018 will be held in Frankenmuth, Michigan at the Bavarian Inn on June 22-24th. The Bavarian inn is unique in that it is a family owned resort with a German heritage theme and the family is very involved in the day to day running of the Inn. Please understand that some things may feel and look different than a corporate resort including the reservation process. You truly feel a strong family focus through the whole experience from each room representing a family in the town to their 94 yr old family matriarch cooking in the kitchen when we were visiting. These are just some of the reasons we felt it was a good fit for Kazapalooza 2018! Oh, and the Pretzels and Strudel are fabulous! 3700 Robert Trent Jones Trail, Opelika, AL, 36801, (334) 741-9292. There are TWO steps you need to take in order to attend. 1st- Reserve your hotel room. 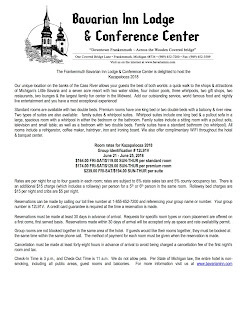 We have contracted with the hotel to get discounted room rates. We are in the Kazapalooza block. They have a small, limited supply of suites. ALL ROOMS have a mini fridge and balcony. If you plan on coming in early or staying late (Thursday or Sunday) it is recommended that you reserve these rooms early. They cannot guarantee the room block price for as long as the Friday and Saturday nights. They are limited so reserve those early before they run out. Reservations must be made before May 23, 2017. 2nd - You must separately register for our event. Having a hotel room at the resort does not get you into our Kazapalooza events. Follow this link and fill out one form per person attending. A day or two later I will send you an invoice through Paypal to pay your registration fees. The fees are $75 per adult and $65 per child age 3-12. Children age 2 and under are free. The fees cover costs associated with putting this event together. That includes goody bags, audio visual equipment rental, meeting space for meals, supplies for raffle, extra activities for families throughout weekend, dinner Friday night and Saturday lunch. We will be pinning this post to the top of our Facebook page and adding to it when we get the schedule, etc. We are so excited about KP 2017 and cannot wait to see you all!